I am an active, twenty-something “foodie” with a passion for nutrition and eating natural, real food — nothing too fussy, over-processed or complicated. Growing up, I was the girl that didn’t read novels or magazines – I read cookbooks and recipes. In a large skillet, heat coconut oil over medium-high heat. Add turkey and shallots and saute until cooked through and shallots are translucent stirring frequently, about 5-6 minutes. Break up any large chunks of meat while stirring. Add zucchini and spices and saute for another 2-3 minutes. Add diced tomatoes, beans and almond butter and stir until combined. Turn heat to low and let simmer for 10-15 minutes, until thickened. Garnish with shredded cheese, sour cream, avocados, or other toppings of your choice. Nora, it was great to stalk your blog this month, I hope you had as much fun with your own assignment! For my readers: if you want to marvel at the productions of other members of my group, go poke a blue frog… (now that sounds pretty nasty, but she is harmless, and enjoys the attention). Hi Sally, sounds like the almond butter really gives this chili something special. Looks like a perfect week night meal. I took the liberty of editing …. 🙂 I don’t mind it at all, in fact I love the name Ela – did you know Ela in Portuguese means “she” – quite feminine…. love it! This looks so good, Sally! And your photos are making me so hungry 🙂 Great pick this month. I am also a bit hungry looking at the photo and remembering how creamy and luscious this dinner was…. Sally this chilli looks amazing! I’m happy to see that it’s a quick weeknight meal and packs lots of flavors. I’m working on finishing a manuscript this month as well so I have little time for cooking and this will be perfect. Stalking is great! I just wish I had more opportunity to stalk this past month – but I subscribe to your blog, so I am always up to date with your culinary adventures…. that’s what matters! What a fantastic pick! That chili looks so so delicious 🙂 Love that it has zucchini in it, too. Happy Reveal Day! The zucchini was a surprising addition, but I would definitely keep it in the recipe, and I normally don’t care for beans in my chili, but this one… conquered me. Sally, that chili looks thick and rich! Never thought of almond butter in chili, and now I am intrigued by the idea. This is a must-make! What a great pick this month – intriguing ingredients and I am going to have to remember to give this one a try!! Tasty chili on a weeknight? Now that sounds like a dream. Mr. N would be so thrilled with this. He is our number 1 chili fan. He can’t resist any and all things chili. Looks like this one wouldn’t disappoint. I hope that your publication is going well! How interesting! I would never think to put ALMOND BUTTER of all things in chili! But I bet it makes it nice and creamy! Sounds delish! I was surprised too! But it works, and very well… give it a try! Sally, that sounds delicious, and surprisingly easy to prepare! Thanks for the recipe, we have mutant zukes in the backyard, so this would be a great way to use them! Oh, your mutant babies will work like a charm here! Interesting almond butter addition! 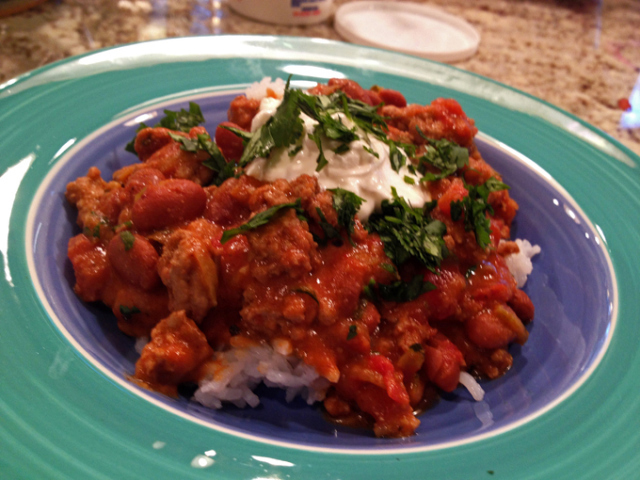 Will have to try this soon since I like chili but hate making it. Chili can be a bit of an involved act in the kitchen, all the dicing, the long hours cooking… this version is user-friendly – and awesome! I do like a good chili but have never tried one with turkey. This looks delicious and healthy. Great pick for SRC. It is a nice change, easier to digest compared to the beef/pork version – I really loved this recipe and Phil already asked me to make it again…. the life of a guy married to a blogger is not easy. You never know when something will be again at the table! too many recipes waiting in line! Almond butter in chili!? I’ve had chocolate in chili before and now I have to try this. Yes, chocolate goes surprisingly well in savory dishes… I am with you! Crazy! I never would have thought to add almond butter to Chili! This looks amazing! Me neither, but now I see it as a completely natural move… and tasty! Wow. I am completely in love with the looks of this dish! I have never added almond butter to my cooking (just in my baking experiences) but goodness why not! – a delicious addition I am sure. What a great choice for SRC. This chilli looks fantastic and I am utterly intrigued by the inclusion of the almond butter – definitely have to try that! Pretty fun to try a new take on a favorite ingredient! What a fun play on chili! And it sounds like your busy month was also a productive month. Always a good sign! Now, all we have to do is sit and wait, biting our fingernails for the decision of the referees…. I have a good feeling about it, but until it’s all said and done, signed, sealed, delivered, I don’t relax. Wow, that is a great chili recipe. For years now I have been on the lookout for a good chili recipe that is not heavily laden with fat. This looks like the one. Especially using turkey rather than beef. I’m going to make this. Love the spice combination and my goodness almond butter, nice! Oh, and I had to “follow” your blog again. WordPress quirk. I wouldn’t dream of skipping the almond butter….our relationship is safe! Thanks, Karen! I am optimistic about the publication, it will be HUGE for our lab if we get it accepted in print. This looks like a great bowl of chili, Sally. Though I’ve never cooked with almond butter, you’ve never steered me wrong so I’ll have to find some so that I can make this chili. I’d love to bring some to Zia. She’s been on a ground turkey “kick”, of late, and I’m sure she’d love this. Thanks for sharing another great recipe, Sally. Oh, I would love if you made it for Zia! Quite a honor! I never would have thought about almond butter, so interesting! I feel like I need to make this today since its cold and raining! I’ve had peanut and almond butter in stew before (African inspired notably) but never in chili… great idea. This does sound like a weeknight wonder and it has all of the flavours our family loves. I’m also always appreciative of recipes that improve with age ;-). I’m adding this one to my grocery list — it’s a keeper! I love a chili recipe with a new ingredient! Almond butter! Who would have thought! Thank you for sharing Sally. Brilliant! A great recipe indeed, hope you can give it a try sometime, I suspect you and your hubby will love it, and maybe even Lucy too! That last photo is irresistible. Now that it’s getting cooler, this dish will be perfect. What a great recipe twist – my husband would love this! Great pick! wow i’d never think of using almond butter in chili. Yum! 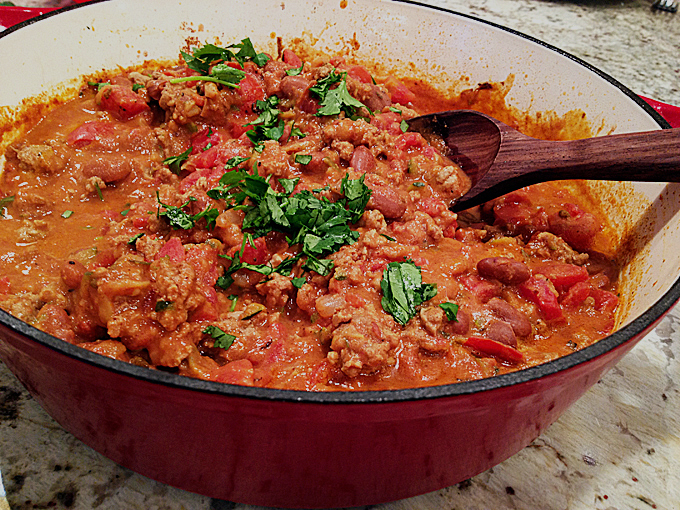 Love the idea of adding almond butter to chili. Great Pick!